Much controversy and secrecy revolves around discussion and use of blue-eyedwhite alpacas (BEWs) in breeding programs. Blue-eyed white alpacas are all-white alpacas, with blue eyes, which are often (but not always) deaf. Recently some alpaca farmers have suggested that the BEWs should not be used for breeding so this gene can be eliminated from the American alpaca gene pool. This suggestion reflects some of the misinformation that surrounds the issue of BEWs. This article will discuss the genetics of BEWs. What we know about the genetics, given the paucity of reliable breeding data on the subject, is limited because some farms don’t acknowledge if their herdsire or dam has ever thrown a BEW, and relatively few BEWs are actually ARI registered (an when registered they are registered as white not BEW). the multi-color phenotype. These different phenotypes are due to apparently dominant alleles. Each parent passes on one allele from each gene in their gametes (sperm and egg cells). One copy is in the sperm and one copy is in the egg. The fertilized egg ends up with one copy from each parent. Dominant alleles mask (override) recessive alleles. This means if both alleles are present, only the dominant allele’s phenotype is seen. This means an alpaca only needs to get one copy of the gene for the trait to show up in the phenotype. 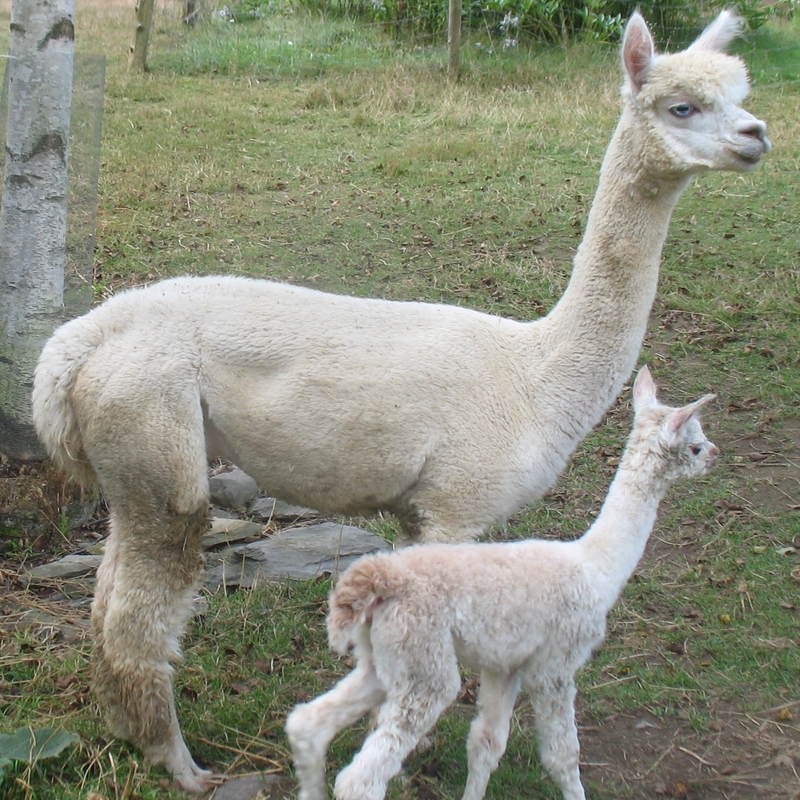 However, an alpaca born with two copies of these dominant alleles (like gray, white faced, tuxedo) produces a new (additive) phenotype, a BEW, or may not be born at all (Liz Paul believes grey by grey mating produce a lethal combination 1/4 of the time, and these are aborted, Paul 2003). It seems that BEWs occur when a cria receives a white-spot allele and/or roaning/graying allele from both parents. To see what possible outcomes exist for any breeding, it is easiest to create a Punnet Square that shows the possible allele combinations for the offspring of any mating. So half the offspring will be white-faced and half will be solid colored. Something different happens when both parents have white-spot alleles. Some offspring will receive two copies of dominant alleles. These will have the blue-eyed white phenotypes. So 1/4 will be BEWs (the WF/G), 1/4 will be grey (G/S), 1/4 will be white-faced (WF/S) and 1/4 will be normal (S/S, solid colored). That is how BEWs can be created. It is important to note that some all-white animals have white spots on them, but you cannot see white markings on a white animal. Also, one version of the white spot gene is an allwhite animal (think of it as a white spot that covers the whole body). So it is possible to get BEWs from all-white’s bred to white-spot or grey animals. Also, it is possible that an animal has a TINY white marking that you cannot see, or easily see. I have seen animals that threw a BEW that appeared solid, but upon close examination, a tiny white spot was found between the toes. The question then remains, what happens when you breed a BEW? Should you use one in your breeding program? If the above scenario is correct, then BEWs should always contribute a white-spot allele or roaning/graying allele to a breeding. Therefore, if you breed a BEW to a non-white, solid animal, you should not get a BEW cria from the breeding, but all cria are likely to have white-spot or grey/roan markings. Now you have an educated guess as to the risks of breeding for making a BEW and for what a BEW animal might throw. hairs in the cochlea in the inner ear. Failure of melanin to reach these cochlear hairs results in their death soon after birth, and deafness. Similarly, failure of pigment cells to reach the cells that will become the eyes leads to blue eyes. Melanin is distributed by the growing neural crest during embryonic development. Melanin is produced from cells called melanocytes that migrate outward in the expanding neural crest. Melanin is produced in melanocytes from tyrosine (an amino acid) by the enzyme tyrosinase. White spot alleles may or may not include roaning/graying and multi-color phenotypes. Most greys are also white faced (many with tuxedos, white legs, and other patterns). Some greys however have no white markings at all (these are less common, and it is not known if they can throw BEWs). It is therefore likely that the white spot gene and the roan/grey gene are not the same gene, but two genes very close to each other on the same chromosome. They are so close that the alleles of these two different genes are almost always transmitted together (so grey and white faced usually occur together). Occasionally, during meiosis, recombination occurs (crossing over between homologous maternal and paternal chromosomes) and the grey and white spot alleles can be separated, leading to the rare whiteless greys. I am still investigating what multis are and what the likely outcomes of breedings with multis will produce. Returning to the risks of using white spot allele and roan/grey animals in the breeding program. BEWs themselves should not produce more BEWs unless they are bred to BEW or roan/grey animals or other white-spot allele animals. To eliminate BEWs from the gene pool completely we would have to eliminate all greys, white-spotted and pattern animals. Then a good fraction of the white animals would still have white spot alleles. Do we want to eliminate whites, greys, and white spotted animals? I don’t. Animals with white-spot often attract many farm visitors because of their distinctive markings. Greys are beautiful and some of the highest selling alpacas. Other countries breeding programs are breeding for all-white fiber animals (which can be dyed to any color). There is already some prejudice in some other breeding programs against any animals with nonsolid markings because it is difficult to process for fiber mills (colors must be separated prior to spinning and processing). Since the US is not yet a fiber market, but rather a rarelivestock market, we are not necessarily breeding for all-white solid animals. Some in the US have been pushing natural colors, rather than dyed colors. My prognosis is: I don’t usually use herdsires, with white-spot since offspring that have white-spot have more limited considerations with breedings (risk of BEW taking them to gray, and white). In Europe, these animals are devalued on the market (even though noone processes the face fiber anyway where the white spot often ends up), and in fact, other than greys and suris, there are very few white-spot herdsires in use. AOBA fleece judging also penalizes color variation in the blanket. I have no problem with using white faced or grey females in a breeding program (we have a lovely white faced Nic-Nac daughter in our foundation herd that is spectacular). Bred to solids, they will produce 50% solid cria and 50% white spot cria. Greys are very trendy right now, and often command top-dollar at auctions. They are also the rarest color combination, increasing their value for both males and females. Breed them to only solid-colored, non-white animals if you don’t want to risk BEWs. So it is up to you and your breeding program goals. Personally, I would happily breed BEW females to solid non-white males. I would not likely breed a BEW male at all. Eliminating a BEW from the breeding program removes two copies of the white-spot gene from the gene pool, but unless we are also removing greys and other white-spot animals from the breeding program, it will have a negligible effect on the overall level of white markings and BEWs in the North American gene pool. Dr. Andrew Merriwether is an associate professor of anthropology at Binghamton University. Dr. Merriwether received a BA in Medical Anthropology and a BS in Biology from Penn State (1988), an MS in Genetics from Penn State (1989) and a Ph.D. in Human Genetics from the University of Pittsburgh (1993). From 1996 to 2003, Dr. Merriwether was an assistant professor of Anthropology and of Ecology and Evolutionary Biology at the University of Michigan, as well as faculty member in the program of Statistical Genetics and the program of Molecular and Clinical Epidemiology of Infectious Disease. His research has involved human and animal molecular evolution, population genetics and genetic adaptation, including ancient DNA investigations on the origins of camelid domestication in South America. Andy and his wife Ann (a developmental psychologist at Binghamton University) own Nyala Farm Alpacas in Vestal, NY and 13 alpacas at the time of writing this article. More information on their farm, breeding program, and genetic services offered can be found at http://www.merriwether.org/nyala/.